This deck is found for sale on French auction sites every now and then, but there is not really much information about it, except that all the cards bear the inscription 'Photo "L'ÉQUIPE"'. 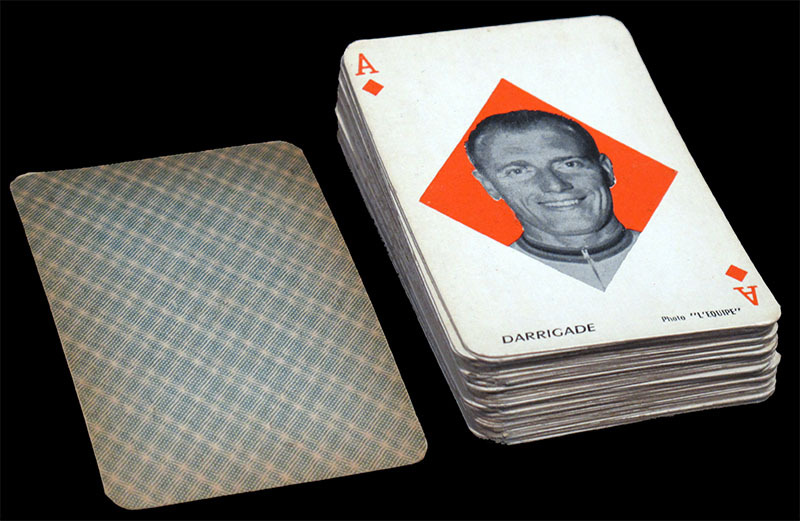 The deck is composed of 52 cards featuring a cyclist each and two jockers. 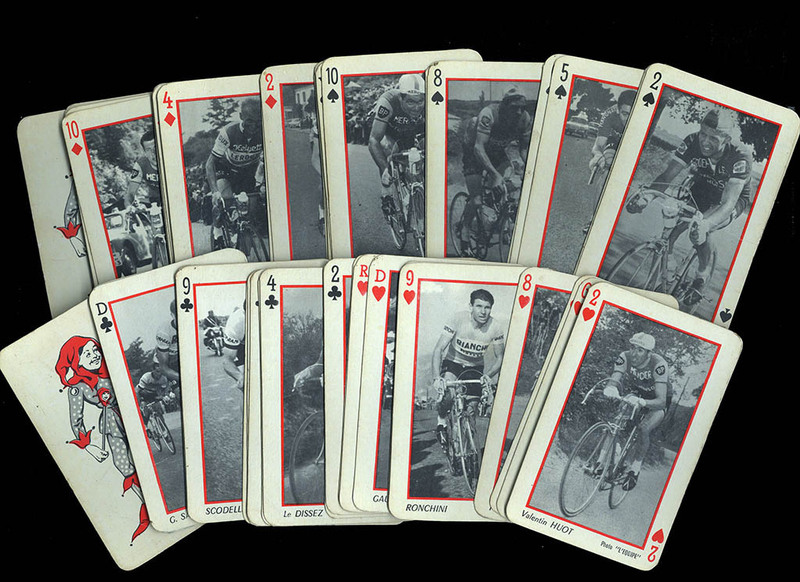 Some decks have a 55th card (see below) with the stages of the 1960 Tour de France. Unfortunately my deck does not have this extra card, so I cannot be one hundred per cent sure if the card really belongs to the deck, but as far as I know it has the same size and the same back, so it probably belongs to this deck. I have listed each suit in descending order. A number of these riders (Bobet, Gaul, Poblet, Robic, Van Looy, Geminiani, Hassenforder, Stablinski, De Bruyne, Gismondi... to mention just a few) did not take part in the 1960 Tour de France. Miquel Poblet, for instance took, though he was a very important rider ar the time, developed almost all is career in Italy and only took part in three editions of the Tour (1955, 1956 and 1957). 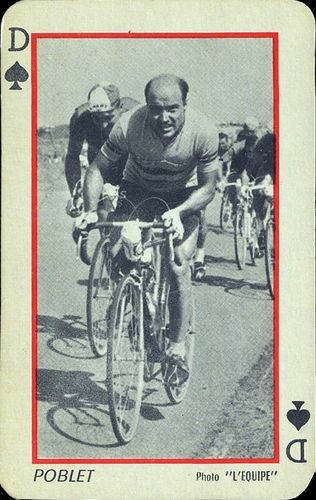 On the other hand Rik Val Looy did not run the Tour until 1962. It is important to mention that the game does not feature Fausto Coppi, who died in January 1960 while he was still racing, and who might have been featured had the game been released before his untimely death. By the way, cyclists are pictured wearing their commercial teams jerseys, while the Tour de France was contested by national teams from 1930 to 1961 (and again in 1967 and 1968). 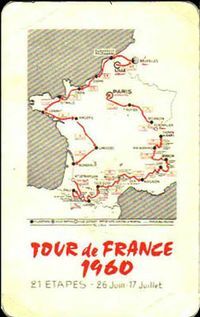 Although I have no reason to doubt that the game was made by (or in collaboration with) l'Équipe, and that the game is from 1960, I am not so sure it is a "1960 Tour de France" game, even if it included a card with the map of the race.